Voting Hours: from 2:30pm until such time that all Members in the House desiring to vote on the polling day have voted. Candidates are advised that canvassing for votes shall end on Tuesday the 20th November 2018 in line with Section 43 of the Elections Act No. 6 of 2013 which prohibits any campaign meeting within twenty four hour before the polling day. 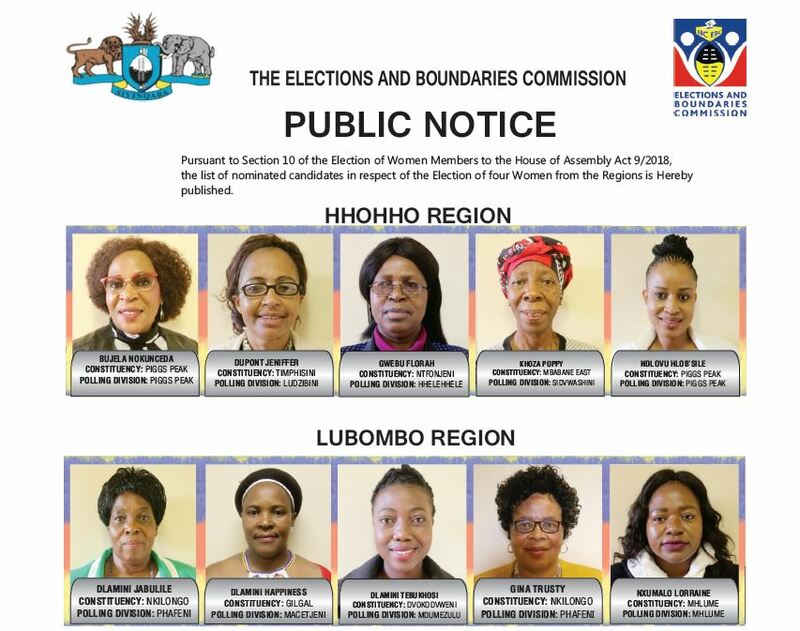 Libandla letelukhetfo nemincele, Elections And Boundaries Commission (EBC), latisa sive semphakatsi wase Mbangave phansi kwenkhundla yase mhlambanyatsi ngelukhetfo lwekuvala sikhala sabucopho. Kubala emavoti: 3 Lweti 2018 (Emuva Kwekucedza Kuvota). Sive siyakhutsatwa kutsi siphume ngetinkhani kuba yincenye yalomsebenti sikhumbule kuphatsa emakhadi ekuvota. Lolahlekelwe ngulelikhadi akete naye utawusitakala esiteshini sekuvota. Simemetelo sikhishwa ngu sihlalo welibandla lemincele nelukhetfo, Chief Gija II. It has pleased his Majesty King MSWATI III to appoint the following as senators in the eleventh parliament of the Kingdom Of Eswatini with immediate effect. The Elections and Boundaries Commission on the instruction of their Majesties is pleased to announce the results of the secondary elections and the end of a successful 2018 National Elections. The elections formed part of the country’s exhibition of fifty years of peace and stability. This master piece was demonstrated in front of internal and external observer missions who all in one declared our election as credible. As announced in the state of preparedness the commission implemented its activities from pre-election to election stage with utmost professionalism based on regional and international standards and best practices. The high voter turnout and participation from registration to election stages is an illustration of a fast growing nation in politics founded on its cultural values and norms. 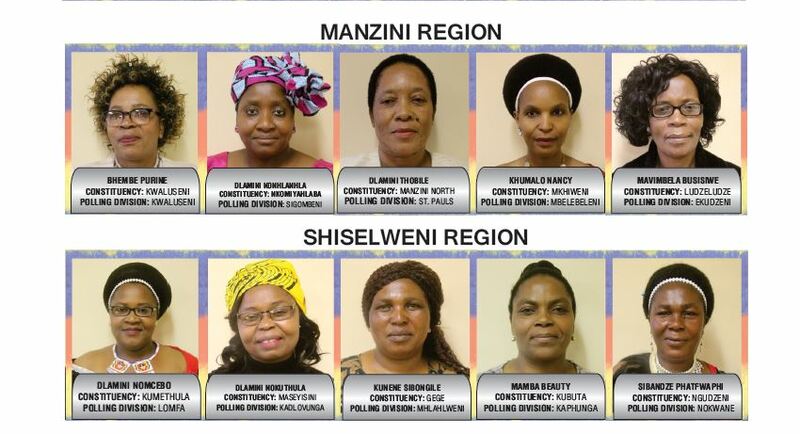 The results of the secondary elections once again indicate negatively on the participation and election of women to political positions. 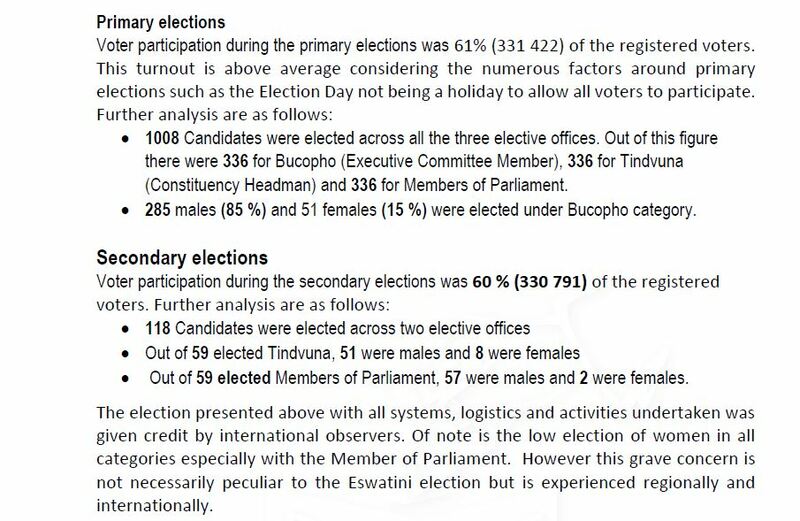 This is across all elective offices but worse in the election for Member of Parliament category where only two women candidates were elected as members of parliament. 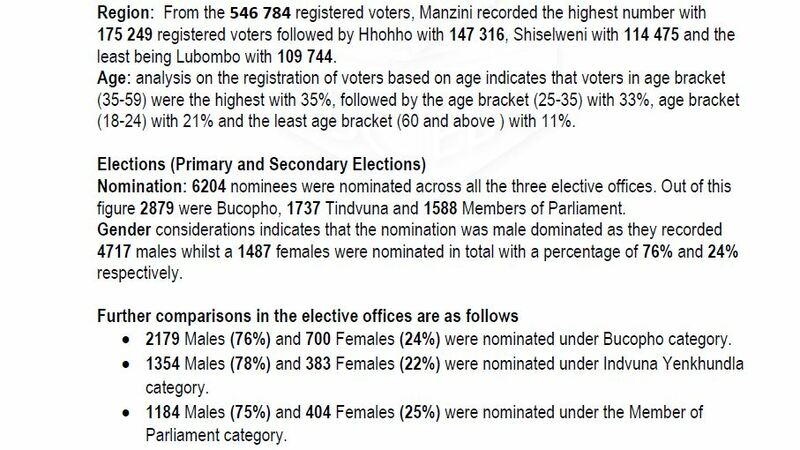 The results also indicate a tie in the Indvuna Yenkhundla category in the Mbabane West inkhundla. A by election is scheduled for Saturday 29th September, 2018 at Mbabane West. The polling stations will open at 7am and closing time is at 7 pm. All polling procedures will be followed as prescribed. Special voting will not form part of this exercise for logistical reasons. The commission extends its gratitude to his Majesty’s government, stakeholders and the nation at large for making this year’s election a great success to cherish for many years to come. This kind of political character lays a good foundation for a better and brighter Eswatini. THE ELECTIONS AND BOUNDARIES COMMISSION (EBC) IS HAPPY TO ANNOUNCE THAT THE SET DATE FOR THE SECONDARY NATIONAL ELECTIONS STILL STANDS AS SCHEDULED – THIS FRIDAY SEPTEMBER 21 FOR ELECTING A MEMBER OF PARLIAMENT AND INDVUNA YENKHUNDLA. THE ELECTION DAY HAS ALSO BEEN MARKED A PUBLIC HOLIDAY IN ORDER TO ALLOW ELIGIBLE VOTERS TO PARTAKE. 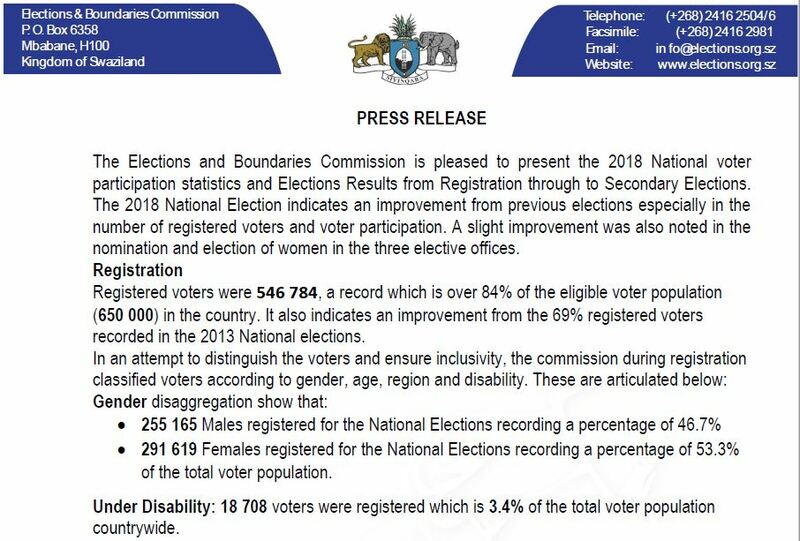 ELIGIBLE VOTERS ARE TO BRING WITH THEM THEIR VOTER CARDS OR NATIONAL IDENTIFICATION CARDS AND THE STARTING TIME IN ALL POLLING STATIONS IS FROM 07:00AM TO 19:00HRS. THE COMMISSION HAS ALSO NOTED WITH GRATITUDE TO EMASWATI FOR THE SUCCESSFUL SPECIAL VOTING WHICH WENT SMOOTHLY YESTERDAY AT THE MAVUSO TRADE AND EXHIBITION CENTRE. ANNOUNCEMENT BY THE ELECTION AND BOUNDARIES COMMISSION. THE ELECTIONS AND BOUNDARIES COMMISSION (EBC) IS HAPPY TO ANNOUNCE THAT SPECIAL VOTING FOR THE 2018 SECONDARY ELECTIONS FOR MEMBER OF PARLIAMENT AND INDVUNA YENKHUNDLA SHALL TAKE PLACE ON TUESDAY SEPTEMBER 18, AT THE MAVUSO TRADE CENTRE IN MANZINI. ALL ELIGIBLE VOTERS ARE URGED TO BE ON TIME AND ARE TO BRING WITH THEM THEIR VOTER CARDS OR NATIONAL IDENTIFICATION CARDS. ALL SECURITY AND UNIFORMED AGENCIES SUCH AS, THE ROYAL ESWATINI POLICE, UMBUTFO WESWATINI DEFENCE FORCE, ESWATINI CORRECTIONAL SERVICES, EMS etc. WILL START VOTING FROM 07:00AM TO 10: OOAM. THEY MUST COME WEARING THEIR UNIFORM. THE ELECTIONS AND BOUNDARIES COMMISSION STAFF, POLLING OFFICERS AND OTHER AGENCIES WHO WERE APPROVED FOR SPECIAL VOTING WILL START FROM 12:00 NOON TO 16:00HRS. ALL POLLING OFFICERS MUST BRING WITH THEM THEIR EBC NAME TAGS, VOTER CARDS OR NATIONAL IDENTITY CARDS FOR IDENTIFICATION PURPOSES. EMPLOYERS ARE URGED TO ALLOW THEIR EMPLOYEES TO TAKE PART IN THIS IMPORTANT EXERCISE. THE ELECTIONS AND BOUNDARIES COMMISSION (EBC) IS HAPPY TO ANNOUNCE THAT SPECIAL VOTING FOR THE 2018 PRIMARY ELECTIONS FOR BUCHOPHO, MEMBER OF PARLIAMENT AND INDVUNA YENKHUNDLA SHALL TAKE PLACE ON TUESDAY AUGUST 21, AT THE MAVUSO TRADE CENTRE IN MANZINI. ALL ELIGIBLE VOTERS ARE URGED TO BE ON TIME AND ARE TO BRING WITH THEM THEIR VOTER CARDS OR NATIONAL IDENTIFICATION CARDS. ALL SECURITY AGENCIES SUCH AS, THE ROYAL ESWATINI POLICE, UMBUTFO WESWATINI DEFENCE FORCE AND ESWATINI CORRECTIONAL SERVICES WILL START VOTING FROM 07:00AM TO 10: OOAM. THE ELECTIONS AND BOUNDARIES COMMISSION STAFF AND ALL OTHER AGENCIES WHO WERE APPROVED FOR SPECIAL VOTING WILL START FROM 10:30AM TO 16:00HRS. HHOHHO NORTH: WEDNESDAY AUGUST 15, AT GOBOLONDLO STARTING FROM 2PM TO 4PM. MANZINI (MANKAYANE SUB REGION): FROM 09:00AM TO 11:00AM AT THE MAVUSO TRADE CENTRE ON SATURDAY AUGUST 18. THE REST OF MANZINI WILL BE FROM 2PM TO 4:00PM ALSO AT THE MAVUSO TRADE CENTRE, SATURDAY AUGUST 18. PART OF THE TRAINING WILL INVOLVE INTER ALIA: THE CONDUCT OF NATIONAL ELECTIONS. (g) Counting and announcement of closing of elections: To be done soon after results.